The five posts accommodate, on inserted pegs, sets of plywood tablets designed and carved by children at Caldecott Primary School, Abingdon during a Creative Partnership project, January/February 2011. The carving on the posts reflects the story of Odysseus and his men getting shipwrecked, captured by the giant Cylcops and then escaping from the island. I have carried out several Creative Partnership projects in schools using woodcarving as a vehicle for addressing the project aims and objectives. At Caldecott Primary School the aim was to address the question : "Can transforming the learning space encourage positive risk taking in children and staff?" Working with the story of Odysseus and Cyclops the children gained more confidence in speaking, practised their writing and gained new confidence and ability through using carving tools for the first time. 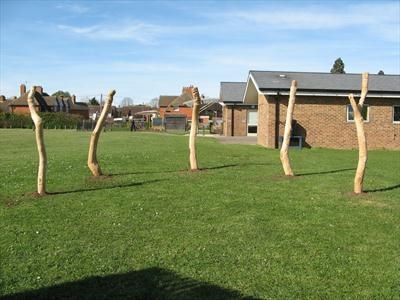 The siting of the Story Posts in the school grounds creates a new outside learning space.